Russian farmers are said to have used this method to multiply numbers between 6 and 10. The fingers are numbered from 6 to 10. Any couple can then be multiplied. Lucas and Rebecca examines whether the method works. It does! And it was fun! in English: Are both hands labeled 6-10? I don't get it. I'm not seeing how you get 50. This would take more time for my elementary student to figure out. Sorry but this is not helpful and your explanation is not very helpful. Here's another example: 6x7...touch left thumb to right forefinger. You have 3 fingers total (two touching, one--the thumb--below). 3x10=30. Next, you have four fingers above your thumb on the left, and three above your forefinger on the right. that is 4x3=12. 30+12=42 (6x7=42). I believe this is very helpful for those that like to think outside the box. I think The Egan 4's comment was rude. The explanation is fine. 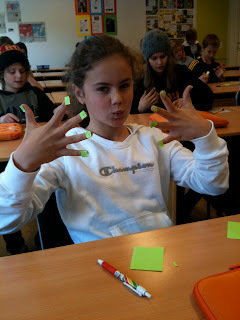 And the pictures help to show how to label the fingers. Thank you for showing us a new and different way to teach our students. Very interesting! Thank you for sharing the information. We are homeschoolers and the rote memorization of multiplication tables is monotonous. This will be fun to try. PS your explanation was exquisite! works all the way up! That is an awesome point! Thanks for bringing that to my attention. I am terrible at math (I am SOOO right brained) so any little tricks are a huge help to me. Mrs. B asked why this works, and I was curious too, so I worked out the math. Here it is. First, I'm representing the two original numbers being multiplied together as x and y. The number you'll be adding to the above expression can be represented by: (10-x)(10-y). 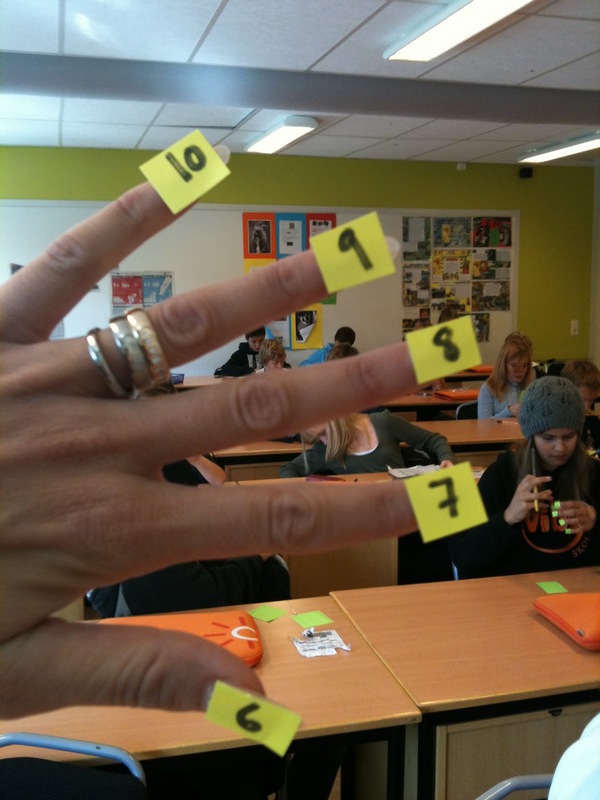 I have my kids write the numbers on their fingers with marker, but the sticky notes are a great alternative. Oh my goodness, you weren't joking when you said that video was excruciating. This video - http://www.youtube.com/watch?v=twv-ynv_m9o - isn't quite as clear, but since he walks you through three examples, you should be able to understand the process by the end. More importantly, it isn't nearly as painful to watch. Multiples of nine is super easy. Hold out both hands with your fingers splayed. Let's say you're multiplying 9x3. Bend the middle finger of your left hand. You have 2 fingers (pinky and ring) to the left of your bent finger, and 7 to the right. 9x3=27. 9x7. Bend the pointer finger on your right hand. You have 6 fingers to the right of your bent finger, and 3 to the left. 9x7=63. THAT made sense to me! I am a homeschooler and teaching the tables to my daughter was quite excruciating indeed since her brain works much like mine, poor girl! ;) THANK YOU for explaining this in a way that makes sense to this gal! I've read ALL the responses along with the original article, and you helped me understand the concept in a way my mind can use it :) No offense to anyone else, my brain tries hard to understand your explanations too, it just has to be made visual for me :) Thanks again! This is a neat trick, but the blog post explains the very poorly. I had to read the comments to understand. Brenda, thanks for explaining. I finally get it. The blog post was a little confusing. I think there's a language barrier. The post introduces the method intriguingly, and I think the Egan 4's comment was unnecessarily harsh, but I will search for more information about this method elsewhere. I had to do it four or five times before I really "got it" but it was incredibly easy after that. Same for my 11 year old daughter. I think a picture of the fingers touching would help the explanation. I am pretty good at math and it took me reading over and over and trying it several times to figure it out. I do get it, but a picture of the fingers touching would be a great help. Left finger touches right finger of the numbers you are multiplying. The fingers touching plus the fingers including thumbs are the 10s. Then the fingers above touching )towards pinkies are multiplied. Great idea!!! This is how my remedial math teacher taught us to do the higher numbers! I had forgotten how to do it!! Thanks!! Wow. Once I got the hang of it, I found it fascinating. I can't wait to share this. Thanks! I have added this trick to my own page and linked back to you for giving me the idea. Have a great day. I've always been good at higher level math, but I still have to stop and think about my multiplication facts from 6-8. No more! This trick is so helpful! I wish I'd learned this years ago. I agree that the directions were confusing; I think many of us misunderstood and thought that instead of counting the number of fingers above and below the fingers that were touching, we were supposed to be combining the values written on those fingers. Once I read Brenda's example I understood that the only time the values written on the fingers mattered was when you were figuring out which fingers should be touching. However, given that this is a post written in English on a Swedish website, I think we should all be more forgiving of a slight miscommunication. OMG why didn't someone teach me this in elementary school!! I'm 50 and just now learning this?! I had to go to another website to figure this out only because you didn't mention putting the numbers 6-10 on both hands - that is why I was confused at first. But thank you! Oh, my goodness...Thanks for all your comments on this blogpost. I completely forgot I hade this blog. A few years ago I went to the states and met some american colleagues. After that visit I decided to translate my swedish blog into "english". I had a lot of post and not a lot of time so I had google translate to do the job in a few seconds... and I know that gives you a lot of confusions but I mostly made the english version for the pictures and maybe some guidens in the text. Sorry about that! You´re welcome to have a look. Im just starting to work again after being home with my third son. I think I get it. I'm going to practice some more but thanks. Touch the fingers together. The fingers that touch: count the number of fingers and multiply by 10 to get your 10's digit. Example: for 7x7 touch the index fingers. This gives you 4 fingers (index & thumbs) to multiply by 10. Then, the other figers (middle, ring, pinky), you mutilply by each other. 3 fingers on each hand. I wish I had known this in school myself, but I can certainly use it with my students. Thank for sharing such a simple explanation that even my 3rd grades could understand it. Some of this year's class of 8 year olds do find it too difficult to use but I have several who use it daily and love it. One thing we did different was to have the students write the numbers on their fingers with washable markers instead of using the sticky notes. Thanks again for sharing this easy to understand and following explanation. I love it. My kids are struggling with multiplication. I can't wait to teach them this method. :) Thank you for sharing.